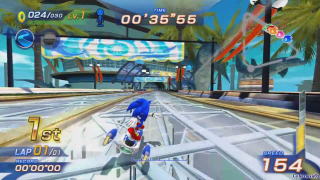 Dolphin Resort is the first racecourse in Sonic Free Riders. A futuristic holiday locale, Dolphin Resort has wide, glass-paved boulevards and water features as far as the eye can see; including a rather prevelant population of dolphins, who tend to leap out of the water at the same time as the racers are performing Extreme Gear tricks to catch Air. The area is the starting line for the racing Grand Prix, hosted by "King Doc of Toreggmania".